Many investors believe they should focus on the long term. Their belief is grounded in stories about how well the market averages have performed over decades. This is certainly true when the investor is focused on an index and the time frame is more than ten or even more than twenty years. But, there are also many investors who can’t wait twenty years or more for wealth. Those investors might consider investing in individual stocks because individual stocks offer more volatility and hence more opportunities for large returns. Of course, volatility goes both up and down. While investors want up side volatility, all too often they experience down side volatility. It’s even possible to see extremes on both sides in the same stock. Puma Biotechnology (Nasdaq: PBYI) was one of the market’s biggest gainers recently. Last year, the Food and Drug Administration (FDA) approved Puma’s cancer drug Nerlynx (neratinib) in the United States. The stock price gained more than 320% in 26 weeks, another large move in a stock with a history of large moves. But, the selling resumed in recent days as the chart shows. The gains track the drug’s approval in the US. Nerlynx received the FDA approval last July for the extended adjuvant treatment of patients with early-stage HER2 over expressed/amplified breast cancer, having been previously treated with Roche’s RHHBY Herceptin-based adjuvant therapy. Subsequently, the drug was launched in the United States in August 2017. Approximately 20% to 25% of breast cancer tumors over-express the HER2 protein. HER2-positive breast cancer is often more aggressive than other types of breast cancer, increasing the risk of disease progression and death. Although research has shown that trastuzumab can reduce the risk of early stage HER2-positive breast cancer returning after surgery, up to 25% of patients treated with trastuzumab experience recurrence. The drug had been in the approval process for years and the longer term chart of the stock shows the ups and downs of that process. The recent sell off comes after the company announced that the Committee for Medicinal Products for Human Use (CHMP) of the European Medicines Agency (EMA) has communicated a negative trend vote after meeting with the Company today to discuss the Marketing Authorisation Application (MAA) for neratinib for the extended adjuvant treatment of early stage HER2-positive breast cancer. A negative trend vote means it is unlikely that CHMP will provide a positive opinion related to the company’s MAA at the formal CHMP decision vote scheduled in February 2018, and that additional steps would need to be taken to gain marketing approval in Europe. CHMP’s opinion was based on the results from both the Phase III ExteNET trial in extended adjuvant early stage HER2-positive breast cancer and the Phase II CONTROL trial in extended adjuvant early stage HER2-positive breast cancer. After a one day decline of more than 25% in the stock, the prospects of a short term rebound seem to be remote. 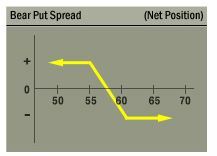 Traders should consider using an options trading strategies known as a bear put spread to benefit from the expected downward price move. The bearish outlook for Puma Biotechnology’s, at least for the purposes of this trade, is a short term opinion. To benefit from this outlook, traders can buy put options. Specifically, the February 16 $70 put can be bought for about $7.00 and the February 16 $65 put can be sold for about $5.00. This trade will cost about $2.00 to enter, or $200 since each contract covers 100 shares, ignoring the cost of commissions which should be small when using a deep discount broker. In this trade, the maximum loss would be equal to the amount spent to open the trade, or $200. This loss would be experienced if PBYI is above $70 when the options expire. In that case, both options would expire worthless. For this trade in PBYI, the maximum gain is $3.00 ($70 – $65 = $5.00; $5.00 – $2.00 = $3.00). This represents $300 per contract since each contract covers 100 shares. That is a potential gain of about 50% on the amount risked in the trade. This trade delivers the maximum gain if PBYI closes below $65 on February 16 when the options expire. There is a relatively low probability of that according to the options pricing models. That indicates the gain is likely to be less than the maximum possible gain. Put spreads can be used to generate high returns on small amounts of capital several times a year, offering larger percentage gains for small investors willing to accept the risks of this strategy. Those risks, in dollar terms, are relatively small, about $200 for this trade in PBYI.